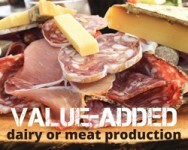 This presentation will introduce you to the ins and outs of small-scale dairy or meat production. Participants can choose to listen to dairy related topics OR meat related topics. Features speakers from CCE Harvest NY, NYS Agriculture and Markets, and CCE Lewis. Register by calling 315-376-5270 or register online.